I spent the day filming tip up fishing pickerel for Tom Gruenwald Outdoors. With an odd ball target like pickerel, there were many options on where we could go but what better than Lake Champlain. Having the right to put out 15 tip ups per person greatly increased our odds. As it turned out, we couldn’t get that many out! As we set up our first tip up, we guessed how long it would take for our first flag to pop. Jamie guessed six and I guessed seven. It was five, so neither of us were right but for the remainder of the day we had steady action. 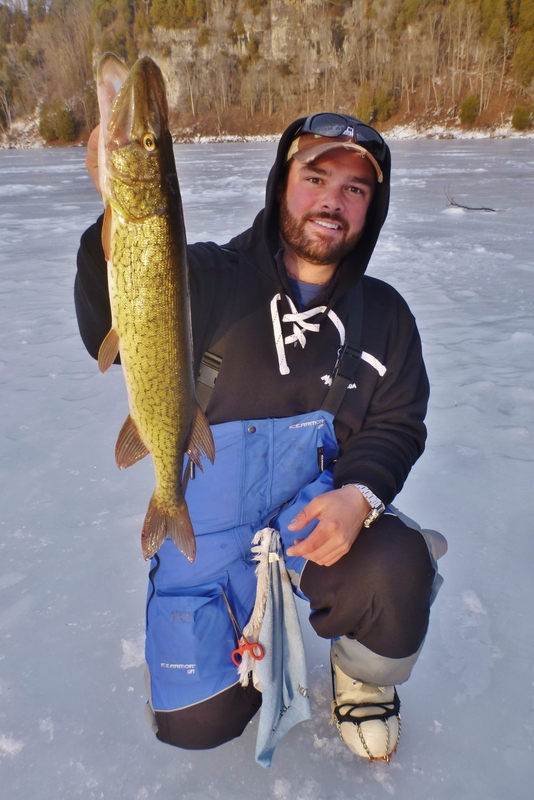 We caught several pike and plenty of pickerel. During some of the downtime we jigged up panfish. As the sun started to set, we were told that there was plenty of footage and we could pick up. After I picked up the first two tip ups I saw that the third one was bumping the hole. I quickly snagged it up and soon landed my biggest pike ever on camera. It went 36″ and unfortunately, I don’t have a picture of it yet. The camera man snapped a photo for me but hasn’t had time yet to send a copy to me. When it comes I will post it up. Previous PostNationalProStaff.com – Clam’s Duckbill Drop JigNext Post1-14-14 – White Perch?